Something to look forward to: Intel has soft-launched their new Z390 chipset to go along with new 9th-gen Core processors. Given that these ‘new’ 9th gen chips use the same Coffee Lake architecture on the 14nm process, we have a good idea of what to expect in terms of performance, power consumption and overclocking headroom. But with an embargo on benchmarks and actual testing for another week and a half, we can't yet reveal how the new platform does against AMD's competing products. When we say soft-launch we mean we can talk about, show you, and even test Z390 boards, but we can't do so with a 9th-gen Core processor. 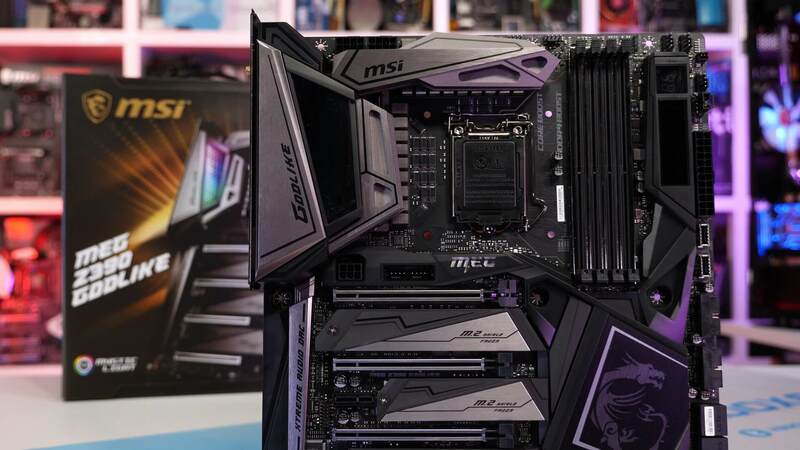 New motherboards like MSI’s Godlike are more outrageous than ever and the entire point of the Z390 chipset as far as we’re aware is to give motherboard makers an excuse to create a range of new boards designed to better support the 8-core Core i9-9900K. Existing Z370 boards will support the 9900K, but many of the cheaper models were designed around the 6-core 8700K and therefore may suffer VRM throttling issues with the 9900K, particularly if you plan to overclock and this is something we will investigate, once we’re allowed to. Initially, our plan for today was to test the VRM thermal performance of half a dozen or more Z390 motherboards using the 9900K, I wasn’t going to benchmark the new 8-core CPU, just use it to place maximum load on the boards power delivery, but that’s not allowed. What we’re allowed to do today is to showcase the Z390 boards we have on hand, give you specs and press materials, do an ‘unboxing’ and/or a live demo with an 8th gen processor. As many of you know, I quite enjoy getting the chance to unbox the latest and greatest tech a few days ahead of release to show you what we’re working on and give a little bit of insight. It’s fun and I get to let you know all the juicy benchmarks are just around the corner. But for this one we aren’t unboxing the main event unfortunately, the new 9th-gen processors. As of today, Intel is taking pre-orders for 9th-gen processors, with the CPUs shipping on the 19th along with our full review. Since we always recommend you wait for independent reviews before making a purchase, knowing the price and specs without yet knowing the performance isn’t particularly useful. 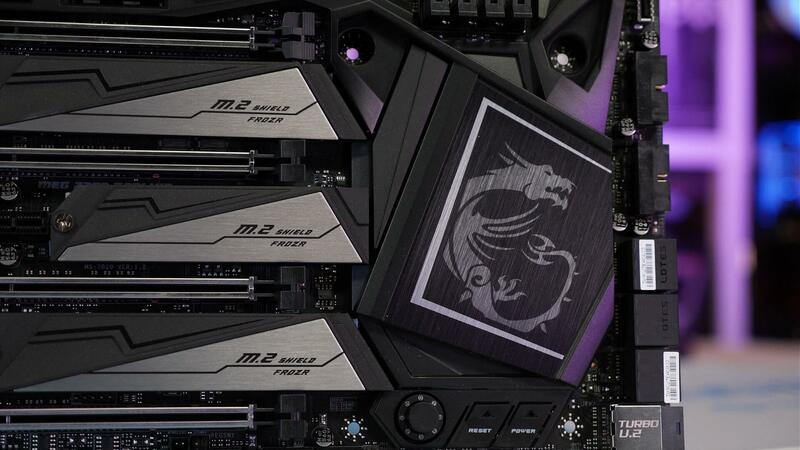 So in the absence of any real testing, what we’ve decided to do is tell you as much as we can about the Z390 chipset, the 9th-gen Core series processors and then show you a few of the Z390 motherboards that we have on hand. Starting with the CPUs, the new Core i9-9900K is listed at $488, the i7-9700K will cost $373 and i5-9600K is $262, all of which are part of the Coffee Lake Refresh. 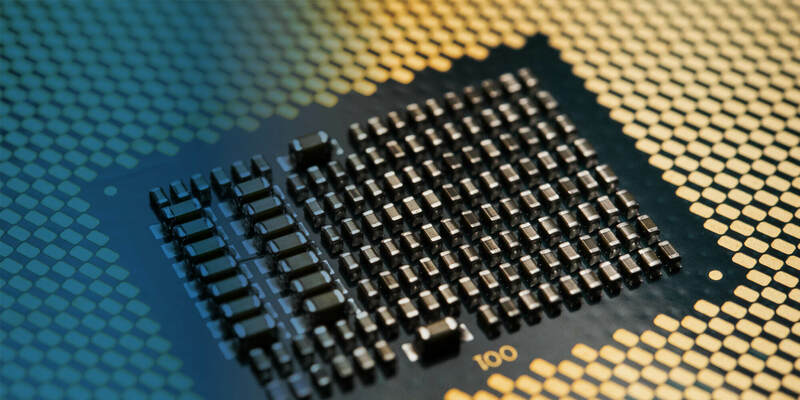 The Core i9-9900K is an 8 core processor with HyperThreading enabled for 16 threads. It operates at a base frequency of 3.6 GHz but will boost as high as 4.7 GHz on all cores with a maximum single core frequency of 5 GHz. The L3 cache has been increased from the 8700K’s 12MB capacity up to 16 MB, and quite shockingly despite packing 2 more cores and 4MB of additional cache, the TDP rating remains at 95 watts which was already a suspiciously low rating for the 8700K. Granted, the TDP is measured from the base, but the 9900K is only clocked 3% lower while packing 33% more cores. This is going to be one power hungry hot little item and an indication of this is the fact that Intel is soldering these chips rather than using thermal paste as they have in the past, at least as far back as 2011. The Core i7-9700K is also an 8 core processor but it lacks HyperThreading support meaning it only packs 8 logical threads. It comes clocked at the same 3.6 GHz base frequency while the all-core and single-core clock speeds have been devalued by 100 MHz and the L3 cache capacity drops down to 12 MB. Finally, we have the Core i5-9600K, a 6-core/6-thread part and this is a rebadged Core i5-8600K with a 100 MHz increase in frequency. 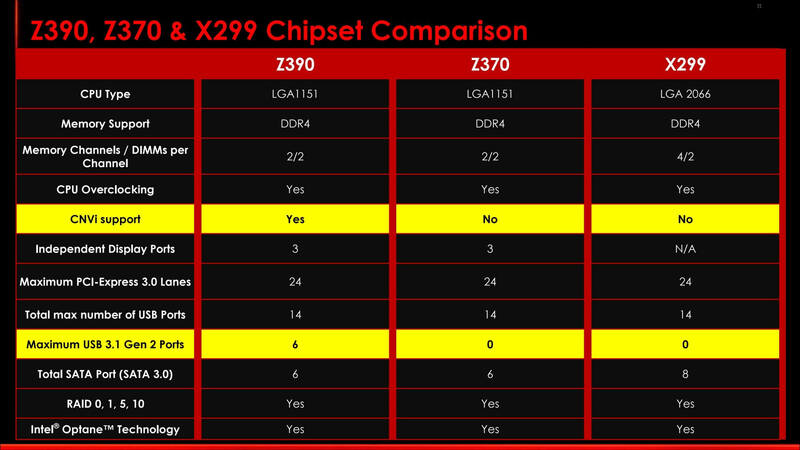 So all three 9th gen parts revealed so far are soldered, provide official support for DDR4-2666 memory, and pack a 95-watt TDP rating, though the 9700K and 9900K are the only truly new CPUs in the series. 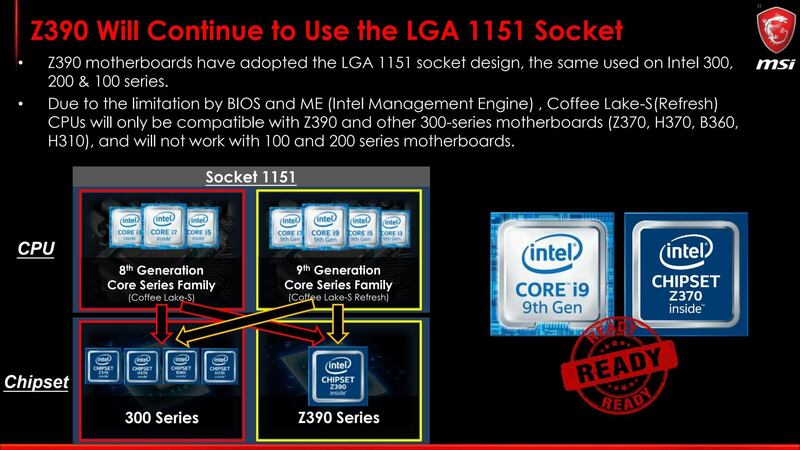 Given that these ‘new’ 9th gen chips use the same Coffee Lake architecture on the 14nm process we have a good idea of what to expect in terms of performance, power consumption and overclocking headroom. 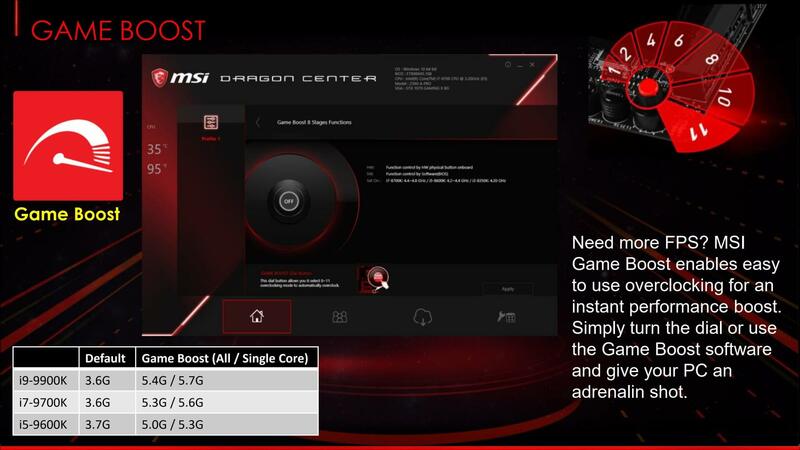 MSI suggests in their press material that 5 GHz should be a typical overclock for the 9900K, but in their "Game Boost" slide advertise a 5.4 GHz base and 5.7 GHz single core clock speed at the turn of a dial. I don’t doubt that this is what mode 11 tries to achieve, but without insane voltages and exotic cooling I can’t imagine this being remotely achievable. My 8700K is considered a golden sample and it can only do 5.3 GHz on the best Z370 motherboards, so not expecting many, if any, 8-core models to hit 5.4 GHz, but I guess we’ll know before too long. 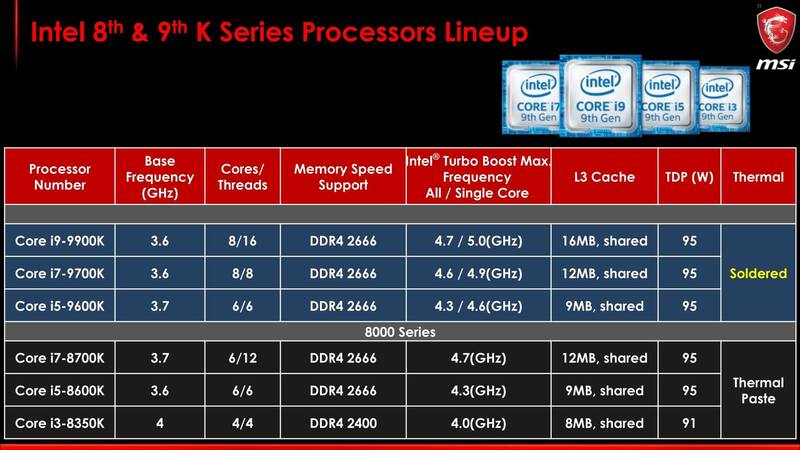 In the same slide MSI advertises a maximum all-core frequency of 5.3 GHz for the 9700K and 5 GHz for the 9600K, so that’s also quite interesting. Moving on we have the Z390 chipset, which like most chipsets these days is a bit unnecessary. When compared to the Z370 chipset, Z390 brings native support for up six USB 3.1 Gen2 ports and CNVi support. The native USB 3.1 Gen2 support means Z390 motherboards should support more of these ports, most of the higher-end Z370 boards offered two 3.1 Gen2 ports using a third party controller. As for CNVi, the H370 chipset that was first to employ Intel's Integrated Connectivity, or CNVi, technology for wireless networking. In short, this moves the bulk of the wireless module into the chipset. This means the M.2 module only needs to house the antenna, making WiFi a much cheaper add-in product. Neither feature is a game changer in our book, and we're certain most of you can do with the versions offered by most Z370 boards. The real reason we have this new chipset is to signify that all Z390 motherboards will be up to the task of extracting maximum performance from the Core i9-9900K processor, that is to say, they will pack a sufficiently beefy VRM. That said, if you already have a high-end Z370 board then you shouldn’t have any trouble getting the most out of the new 8-core models, even if you plan on overclocking. So all 8th and 9th gen Core processors will work on the same motherboards, regardless of whether they sport the Z370, Z390, H370, B360 or even the H310 chipset. We’ve talked about this before, how Intel could open up support for 8th and now 9th-gen CPUs on 100 and 200 series boards, while 300 series boards could support 6th and 7th-gen Core processors, but Intel refuses to allow it. I found it a little humorous that MSI is basically saying Intel is limiting support and all it would take is a few minor software updates and they could make their platforms significantly more consumer friendly. For those that missed it, we heard a similar story from Asus' motherboard product manager Andrew Wu last year. Moving on, we might as well take a quick look at a few new motherboards. 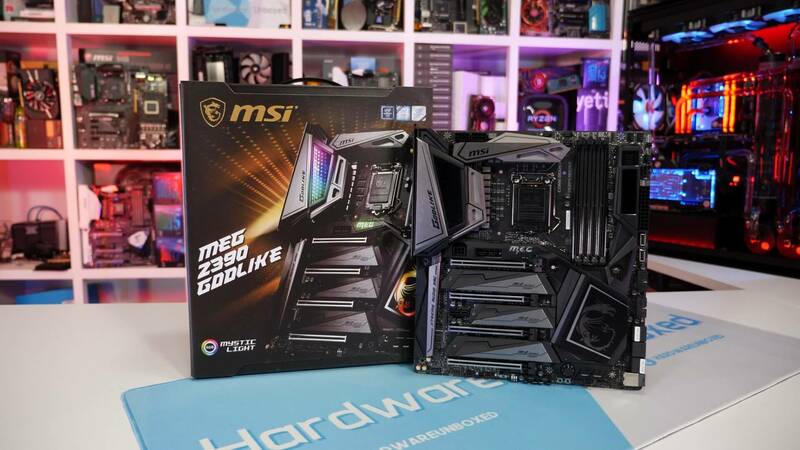 For our sneak peak we have two flagship models, the MSI MEG Z390 Godlike and the Asrock Z390 Taichi Ultimate. Like the Z370 Godlike, this new version is another ‘limited edition’ type deal for those wanting the most extreme Z390 board possible. 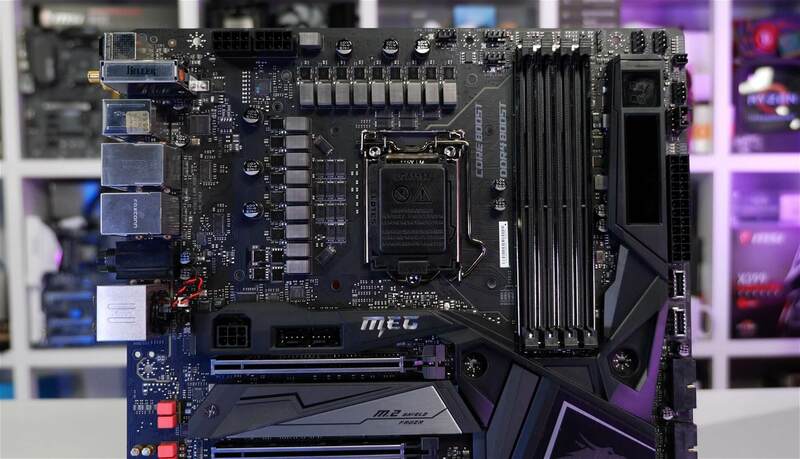 A slightly cut down version known as the MEG Z390 ACE will be available for the life of the platform, too. The highlights of the Godlike include a 16-phase vcore VRM, dual Killer E2500 Gigabit LAN, Streaming Boost PCIe card, and support for five M.2 SSDs out of the box. The ACE version has been downgraded to a still very overkill 12 phase vcore VRM and the M.2 expander card has been removed from the package. The on-board features are quite similar though. The vcore VRM configuration of the Godlike has basically been lifted from the MEG X399 Creation. This means it’s a genuine 16-phase vcore VRM using the IR35201, which supports up to 8 phases. Each phase is doubled using the IR3599 phase doubler which connects to a pair of Infineon TDA21472 power stages for two separate phases. These are 70A power stages, so the Godlike is extreme overkill with a peak current capacity of 1120A. 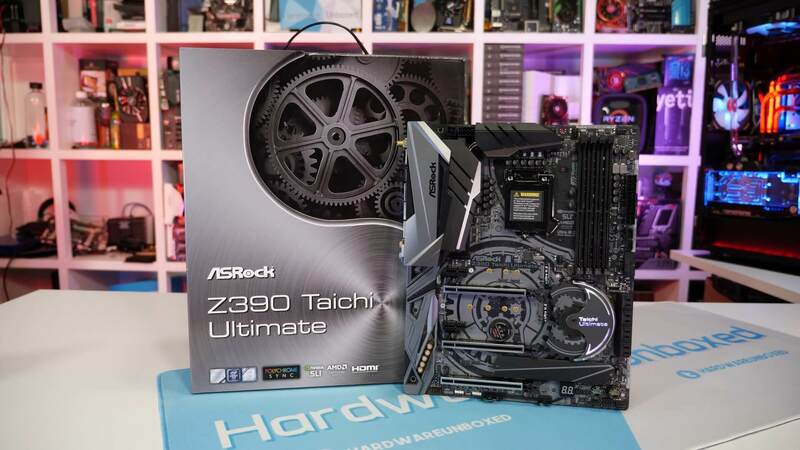 From Asrock the king of their hill is the Z390 Taichi Ultimate and this board packs all the latest bells and whistles as well. Asrock has gone with a 12-phase vcore VRM, which should provide the 9900K with more than enough power, even when overclocked to the max. 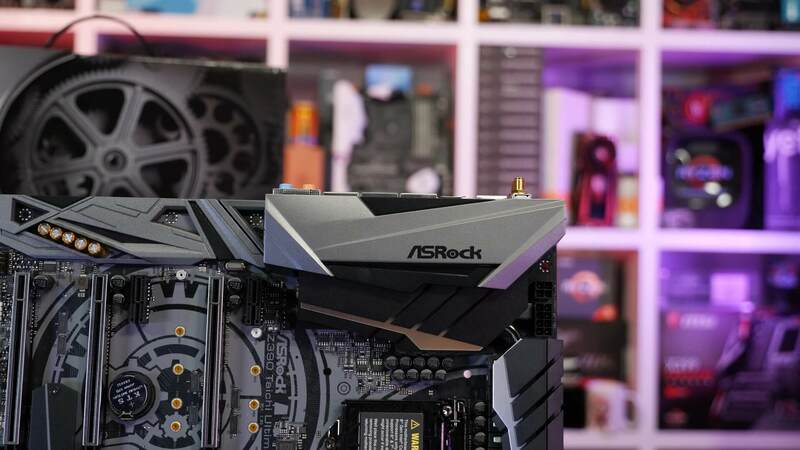 Asrock’s also gone all out on the networking front by including dual Intel Gigabit LAN along with a single 10 Gigabit LAN connection. They have also included an Intel dual-band 802.11ac WiFi adapter supporting up to 1.73 Gbps and Bluetooth 5.0. As for the vcore VRM configuration we have an IR35201 controller connected to six IR3598 doublers which connect to a dozen TI 87350D powerstages rates at a maximum current capacity of 40A and 90% efficiency at just 25A. That means up to 300A can be delivered at 90% efficiency with a peak load of 480A. Neither the Godlike or Taichi Ultimate feature proper finned heatsinks, and while this is much less of an issue for the Godlike, the Taichi Ultimate will probably also run at reasonable temperatures with the 9900K overclocked to 5 GHz for example. It’s fair to say that all Z390 boards are going to cost more than mid-range Z370 boards and the 9900K and 9700K are going to cost much more than previous flagship mainstream desktop CPUs, so it will be interesting to see how they compare to AMD’s Ryzen 7 2700X and B450 board combo. All benchmarks and comparisons are coming soon.